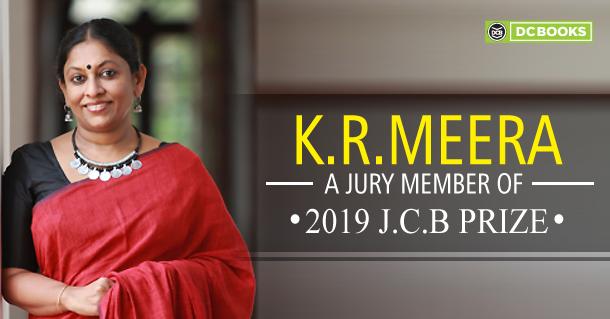 India’s richest literary prize, J.C.B awards has announced their list of jury members for 2019 which includes Malayalam writer K.R Meera. Apart from K.R Meera, the five-member jury comprises of comprises author and critic Anjum Hasan, author Parvati Sharma and economist and former Chief Economic Adviser, Arvind Subramanian. The Filmmaker and environmentalist Pradip Krishen will be the jury’s Chair. K. R Meera began her career as a journalist and published her first short story in 2001. She is known to push her readers to the excruciating edge, be it in Aarachaar ( Hangwoman) or Yudasinte Suvishesham (The gospel of Yudas). For somebody, who take up writing as revenge, in a deeply conditioned patriarchal society, her thoughts are unique and fearless. She won Kerala Sahitya Akademi Award, for Avemariya, Odakuzhal award, Vayalar and Kendra Sahitya Akademi Award for Aarachar. The J.C.B prize amounting to Rs. 25 lakhs will be presented to one pathbreaking work of fiction in English by an Indian author. The award gives attention to works translated from regional languages. The jury appointed by Literary Director Rana Dasgupta is responsible for selecting a long list of ten books, shortlisting five from it and the winner. The first edition of JCB Prize was awarded to Benyamin for Jasmine Days translated by Shahnaz Habib, from Malayam. The entries for this year will close on April 30th and the final announcement will be on November 2, 2019.